Have you ever felt a dull, constant ache in your back? Do you ever reach for the aspirin or ibuprofen and wish there was a natural solution? You are not alone. Back pain accounts for a large percentage of all missed work days and is the most common reason to visit a physician. Pain is your body’s warning signal that something is wrong. Some people choose to just live with it, but ignoring chronic back pain can take a serious toll on your mental, physical, and emotional well-being. What is the best way to deal with mild, moderate, or even severe back pain? Many people are familiar with aspirin, but did you know aspirin is a synthetic substance derived from a powerful, time-tested, natural ingredient from the willow tree? White willow bark’s use as a painkiller and fever-reducer dates back to ancient Egyptian, Greek, Roman, and Indian civilizations when people were either advised to chew on the bark or drink tea made from it. The bark of the white willow tree contains salicin, which is the active component that provides pain-relieving and anti-inflammatory effects. Soon after salicin was first isolated in the early part of the 19th century, the industrial production of a synthetic form of salicin began. This product, acetylsalicylic acid, is now known as aspirin. The salicin found in white willow bark does not become salicylic acid until it is absorbed naturally and metabolized in the liver. Salicylic acid, like aspirin, inhibits the production of specific enzymes called COX-1 and COX-2 that trigger inflammation and swelling in the body. The University of Maryland Medical Center confirms that studies show white willow bark has powerful health-boosting chemicals aside from salicin. (1) This research states that polyphenols and flavonoids are also found naturally in white willow bark and contribute to the anti-inflammatory and fever-reducing properties, but are not something you get with synthetically-made aspirin. One clinical trial on white willow bark was published in the American Journal of Medicine. Researchers performed this study on 210 patients who had aggravated chronic low back pain and reported a current pain of five or more on a scale of ten. They divided the patients into three random groups; one group received a low dose (120 mg) of white willow bark extract’s active ingredient, salicin; one group received a high dose (240 mg) of salicin, and the last group just took a placebo. By the end of the study, the researchers found that 39% of the patients receiving a high dose of white willow bark reported being pain-free. 21% of the low dose group reported being pain-free, and just 6% of the placebo group made such a claim. Although white willow bark is gentle and effective, it’s best to try treating back pain without the use of medicine (even the natural kind) first to see how the body responds. There are a number of natural ways to reduce back pain. For instance, get enough sleep and sleep in a healthy position to reduce the mental and physical toll of back pain. Side sleeping is best, on a comfortably firm mattress, and a pillow placed between the knees ensures the spine stays in a neutral position. Just as it’s important to sleep in a back-healthy position, posture matters a great deal as well. Slouching aggravates (or can even be the cause of) back pain and is a common problem for those who work desk jobs. For those having trouble maintaining good posture, whether when sleeping, sitting, standing, or moving, a physical therapist can help. Physical therapists can also teach core-strengthening exercises and back stretches that can help back pain considerably. An at-home back-stretching routine can also be beneficial. A good one is located here on my clinic’s website (as well as guides for other stretches and routines for various parts of the body). Regular applications of ice and heat to the painful, inflamed parts of the back can help as well. Start with ice and be sure to wrap the ice pack in a thin towel to protect the skin, then apply the ice several times a day up to 15 or 20 minutes each time. After several days, use heat instead. The best way to do this is with a heating pad or warm pack. Between the ice reducing the inflammation and the heat relaxing muscles and increasing blood flow to the affected areas, this kind of therapy is easy to do at home and effective for many people. Rather than looking to natural solutions, NSAIDs (nonsteroidal anti-inflammatory drugs) are often the first place people look for back pain relief. NSAIDs include well-known products like aspirin, ibuprofen (Motrin®, Advil®), and naproxen (Aleve®). The problem with these medications, which typically utilize synthetic ingredients, is that some people experience side effects such as stomach pain and heartburn, stomach ulcers, headaches and dizziness, liver or kidney problems, and allergic reactions. Further, in 2015, the FDA toughened warnings of increased heart attack and stroke risk associated with NSAIDs, but aspirin and salicin were not included in these warnings. Various warnings have been issued for possible side effects related to aspirin and other salicylate containing products. People with gastritis, stomach ulcers, diabetes, asthma, hemophilia, known allergies to aspirin, and those taking blood thinning medications should avoid white willow bark. Likewise, children under the age of 16 should not use white willow bark because of the potential for causing Reye syndrome. The 2015 study in Phytotherapy Research stated that there have been no reported cases of stomach problems, bleeding disorders or drug interactions with willow bark extract. (7) However, allergic reactions have been noted by those also allergic to aspirin. Be sure to speak to your doctor before using white willow bark if you take blood thinners or NSAIDs, or if you have liver issues or an allergy to aspirin or salicylates. Unless you’ve used aspirin in the past and know you’re not allergic or sensitive to it, it’s a good idea to start with small doses of white willow bark and gradually increase the dose. Although many studies demonstrate white willow bark’s ability to fight back pain by itself, some of the top back pain supplements feature white willow bark with a compliment of supporting natural anti-inflammatories to make a powerful complex for pain management. 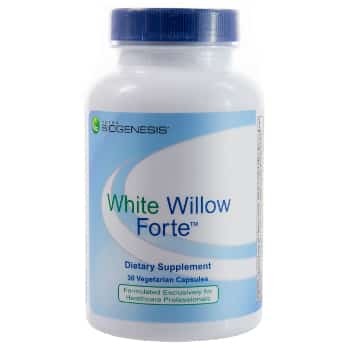 White Willow Forte, by Biogenesis, contains a strong dose of white willow bark (240 mg salicin) with smaller quantities of other well-known natural anti-inflammatories like papain, turmeric, ginger, and bromelain. Biogenesis even makes a supplement that contains white willow bark with caffeine called White Willow Plus (with 240 mg salicin). The anti-inflammatory properties of white willow bark paired with caffeine are believed to be very effective when combined. Pure Encapsulations’ Phyto UltraComfort is another great way to get white willow bark (80 mg salicin) because it pairs it with devil’s claw and boswellia. Phyto UltraComfort also has dl-Phenylalanine, which is believed to support activity that impacts pain-receptive neurons. I hope this article is informative and provides you natural alternatives to prescription medication when dealing with periodic bouts of back pain. If you have any questions regarding the concepts discussed here or anything else, you can reach our customer service team at 888-460-3091 or e-mail them at customerservice@oakwaynaturals.com. White Willow Forte is a unique blend of herbs and nutritional factors that work synergistically to inhibit multiple inflammatory pathways including both the Cox-2 and 5-lipoxygenase enzymes. Provides anodyne and antioxidant support. What is the best way to deal with mild, moderate, or even severe back pain? Many people are familiar with aspirin, but did you know aspirin is a synthetic substance derived from a powerful, time-tested, natural pain reliever from the willow tree? White willow bark is one of the oldest natural solutions for pain and inflammation. The bark of the white willow tree contains salicin, which is the active component that provides pain-relieving and anti-inflammatory effects. Soon after salicin was first isolated in the early part of the 19th century, the industrial production of a synthetic form of salicin began. This product, acetylsalicylic acid, is now known as aspirin. Salicylic acid, like aspirin, inhibits the production of specific enzymes called COX-1 and COX-2 that trigger inflammation and swelling in the body, thereby providing relief of pain. The University of Maryland Medical Center confirms that studies show white willow bark has powerful health-boosting chemicals aside from salicin that are not something you get with synthetically-made aspirin. Studies show white willow bark extract reduces low back pain and appears to be effective not just for minor-to-moderate cases of back pain, but serious cases as well. One clinical trial on white willow bark was published in the American Journal of Medicine. Researchers performed this study on 210 patients who had aggravated chronic low back pain and reported a current pain of five or more on a scale of ten. By the end of the study, the researchers found that 39% of the patients receiving a high dose (240 mg of salicin) of white willow bark reported being pain-free. 21% of the low dose group (120 mg of salicin) reported being pain-free, and just 6% of the placebo group made such a claim. Aspirin has long been known to have a risk of causing gastrointestinal bleeding. So much so that marketers have devised enteric-coated formulations of aspirin advertised as being “gentle to the stomach.” However, an American Journal of Gastroenterology study reported enteric-coated aspirin did not seem to reduce the risk. According to a study from Phytotherapy Research, salicin in white willow bark does not appear to be as irritating to the stomach as either salicylic acid or aspirin, and as a consequence, side effects tend to be mild. Although white willow bark is gentle and effective, it’s best to try treating back pain without the use of medicine (even the natural kind) first to see how the body responds. Try getting enough sleep and sleep in a healthy position to reduce the mental and physical toll of back pain. Side sleeping is best, on a comfortably firm mattress, and a pillow placed between the knees ensures the spine stays in a neutral position. Posture matters a great deal as well, since slouching aggravates (or can even be the cause of) back pain and is a common problem for those who work desk jobs. For those having trouble maintaining good posture, whether when sleeping, sitting, standing, or moving, a physical therapist can help. An at-home back-stretching routine can also be beneficial. A good one is located here on my clinic’s website (as well as guides for other stretches and routines for various parts of the body). Regular applications of ice and heat to the painful, inflamed parts of the back can help as well. Start with ice and be sure to wrap the ice pack in a thin towel to protect the skin, then apply the ice several times a day up to 15 or 20 minutes each time. After several days, use heat instead. The best way to do this is with a heating pad or warm pack. Between the ice reducing the inflammation and the heat relaxing muscles and increasing blood flow to the affected areas, this kind of therapy is easy to do at home and effective for many people. Although many studies demonstrate white willow bark’s ability to fight back pain byitself, some of the top back pain supplements feature white willow bark with a compliment of supporting natural anti-inflammatories to make a powerful complex for pain management. White Willow Forte, by Biogenesis, contains a strong dose of white willow bark (240 mg salicin) with smaller quantities of other well-known natural anti-inflammatories like papain, turmeric, ginger, and bromelain. Biogenesis even makes a supplement that contains white willow bark with caffeine called White Willow Plus (with 240 mg salicin). The anti-inflammatory properties of white willow bark paired with caffeine have shown to provide a statistically significant benefit in promoting pain reduction when combined. Pure Encapsulations’ Phyto UltraComfort is another great way to get white willow bark (80 mg salicin) because it pairs it with devil’s claw and boswellia. Phyto UltraComfort also has dl-Phenylalanine, which is believed to support activity that impacts pain-receptive neurons. I hope this article is informative and provides you natural alternatives to prescription medication when dealing with periodic bouts of back pain. No one should have to suffer longer than you have to or resort to medications than can cause more harm than good.